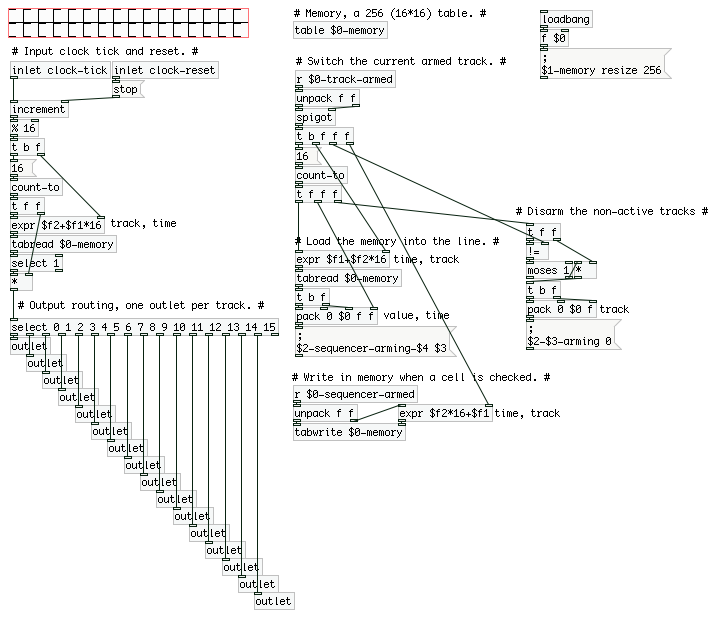 In this post I’d like to present a patch I made for Pure Data, namely a sequencer. Coming from a text-based programming experience, it’s a connect box with lines type of programming game. Although I am relatively new to this technology, I can already tell that it’s a lot of fun to play with! You can download the version you want here and I highly recommend looking at this video series. I assume that you already have some knowledge of Pure Data. If it’s not the case, please have a look at this, this and that. In this part, I’ll introduce some concepts behind Pd and showing some subpatch we’ll be using for the sequencer. A subpatch can be see as a subroutine (although it has many unique characteristics), you extract a piece of code into a box, to make it reusable. In Pd, there’s a common way to create a loop, with an increment index, is to use a [metro] object along with a [float] and a [+]. The [metro] will emit a bang every 500 ms. The [float] will send its value to the number display below it and to the [+ 1]. This is where it gets tricky: the [+ 1] computes the input value plus one, and send this to the [float]’s cold inlet. An object in Pd will only do something if its hot inlet has been triggered, it was the case when the [metro] sent a bang to the [float]. So the new value is stored inside [float], waiting for the next bang to pass it to the number below. To start the [metro], use the [O] (a bang object), and to stop it, use the [stop( message (we’ll talk about messages later, don’t worry about it now.). The second subpatch we want to create is another really simple one. It counts to a specified value and output all numbers from 0 to that value. Before looking below, have a think of how you would do it! It’s good practice to reinvent the wheel when learning something new! [until]: This box emits a number of bangs, determined by its hot input. It’s especially useful when you want to send a specific number of bangs. [t f b]: This is a [trigger] box. It will send a signal from right to left outlet. The parameters indicates the types of the value to send (here it’s a float and a bang). It’s a primordial box, because it’s allowing for a better control over the execution. The [inlet value] gets the number you want to count to. The trigger first sends a bang to the [increment] box, which resets its internal value (see above for details). Then it sends the float to [until] which in turns sends multiple bangs to the [increment]’s hot inlet. Finally its value is sent out of the patch. That’s enough for the intro, let’s get into it! Let’s clarify first what we intend to do here, it’ll help us a lot later. A clock tick, so we can synchronize the patch with the outside world. A reset bang, for when we want to go back from the start. An outlet per track, so we can see the outlet emit a bang when it’s on. You can see the result, it’s sending bang to one outlet at a time. I’m changing the tempo, starting and stopping it with messages. I know, let’s build it, one step at a time. For the purpose of this post, we’ll limit our sequencer to 4 tracks, but it’ll be easy to extend it later. The [select] box is quite simple, it will send a bang to the output corresponding to the input value. This is neat and all but we can’t control our sequencer! No problem, let’s talk about memory now. In order to store informations in Pd, you have different options, [toggle], [table], … We’ll use a table, for its read/write simplicity. We need to store 4 tracks * 4 steps, so 16 values. I used a single [table] and then some maths to get the right index. This allows us to later change the size of our system without having to add anything else. To read from a [table], you can use the [tabread tablename] with the hot inlet specifying the index to read from. And to write into it, you can use the [tabwrite tablename] with the cold inlet specifying the index to write to and the hot inlet the value to write. This box allows to do some computation, with specified inputs, and send the result of the computation to the output. We have the formula to address our memory, let’s use that to read our sequence. Now is the time to do something useful: write the complete code to play the saved sequences. Let’s start with what we already have: we can read and write to our [table]. We can loop over a sequence of numbers, we only need some logic box and we’ll be all set! The [*] is simply a times operation, in the same way as the [%] which was a modulo operation. The [select 1] box is a little more interesting here. It’s acting as a check and will send a 1 to the next box only if it receive one. This followed by a [*] is a neat way to send the track number if it’s active for the current step. On the left side, you can’t tell which number will be printed first (but I can, it’s the 0 because I link the bang to it first). On the right side you can tell, because a trigger always send from right to left. Don’t be like me, use triggers. We could add all required messages for writing, then the message to erase part of the memory (writing a 0 that is), and we’d have our sequencer. Quite simple, quite neat indeed. But one aspect of this patch is to be able to have a UI a bit better than just messages, and we shouldn’t have to see the memory all the time. There’s more work to do! The [s a] will be received by all [r a], this is called the global scope. From a patch and subpatches to all patches and subpatches. The [s $0-a] will be received by only the parent patches and children subpatches. Look how they’re triggering, only on the same patches. You can see the id of the patch, it’s transparently replaced by Pd to bound the scope of the wireless communication. All good? OK, let’s take it one step further. OK, maybe it’s not so clear… The [; $2-$4 $3 ( is doing the send. If you replace the $x with the corresponding input in the packed list, you’ll have something like: [; $0-2 9 (. This is a special case for messages, it sends the value 9 to all [r $0-2]. It may not seems that better, but when you’ll have dozen of sending to do, you’ll be happy to have a dynamic system like this one. One note on the [pack 0 $0 ...]: because the $0 is using the same format as the variables passed in a message box, it would lead to errors, we have to make it clear that we want its value. To do that we pack it (in the pack, the real value will be used) along with other variables, and we can use it as $2 in the message. As you can see, the whole UI is made of two rows of [toggle] boxes. The first one is selecting the track you want to program, the second one controls the steps, active or inactive of the sequence. The row of toggle serves a dual function: first it’s a visual clue of what is active and what is not, and then it’s a simple way to set the memory, because each toggle will point to a place in memory to setup. The row doesn’t reflect the current memory for the track. It’s not clear which track we are on. As you can guess those are our two next (and final!) steps. You can now create an UI that fits your taste and go play with the sequencer! I’ll admit that a 4*4 sequencer is quite small, but you can take it to another dimension quite simply. You’ll have to add as many toggles as you want, keeping in mind to change all number inside the subpatches. Add number to the select and add your outlets. Also don’t forget to change every 4 with your new dimension. You can find the final patch here.